Recently Singapore Policy Journal published an article by Michelle Khoo entitled “Open Data for an Open Society.” In it she called for the release of data to citizens and an independent Statistics Department removed from political control. Under the Statistics Act the Chief Statistician is appointed by the Minister for Trade and Industry (MTI). Each ministry has its own Research and Statistics Unit which is obliged by law to follow the recommendations of the Chief Statistician except if it disagrees the RSU can appeal to MTI who has the power to overrule the Chief Statistician. Ms Khoo cites the UK, Canada, Australia and New Zealand as examples of countries where the identity of the Chief Statistician and the organisational structure of the Statistics Bureaus or Offices are transparent and readily accessible in contrast to Singapore where the identity of the Chief Statistician is treated like a state secret. Many Singaporeans have been screaming foul or using the old cliché, “lies, damned lies and statistics” to describe what goes on with our statistics. To be strictly fair there may have been good reasons for the revisions to earlier quarters. It is true that initial flash estimates of GDP growth are often revised substantially later on in other advanced countries. However in other countries an explanation is usually provided for the revisions. There has instead been a deafening silence on this point from the Statistics Department. This is no different from our government’s silence when asked for data about our surpluses and the true state of our reserves. Though in the government’s case it goes beyond silence and borders on active obfuscation. This would not be my blog if it were not to call for reform of our culture of secrecy and for greater transparency and accountability. In the absence of an explanation from the Statistics Department for the revisions one is inevitably tempted to suspect that there may be some massaging of the figures to prevent Singapore being classified as in a technical recession. Combined with the other dubious statistics produced by the Department to show rising real household incomes, which I have highlighted here and here, it makes a compelling case for the removal of the Statistics Department from government control so as to lessen the possibility of political interference in the calculation of its statistics. 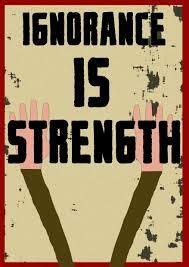 (Again, it wouldn’t be my blog if it wasn’t calling for independence from government control). The UK Parliament in 2007 passed The Statistics and Registration Service Act 2007 which “established the UK Statistics Authority as an independent body at arm’s length from government with direct reporting to Parliament …rather than through Ministers, and with the statutory objective of promoting and safeguarding the production and publication of official statistics that “serve the public good”. We need similar reform here coupled with a Freedom of Information Act. I have called repeatedly elsewhere for greater transparency in the general government accounts, which should include all the Fifth Schedule companies and statutory boards, in particular, Temasek and GIC. I have written a letter to the Editor of the Singapore Policy Journal pointing this out and also my many previous letters to the Finance Minister asking for explanations for discrepancies and gaps in the Budget. The Singapore Policy Journal is published by the John F Kennedy School of Government at Harvard University. Lee Hsien Loong, Tharman and many of the senior PAP Ministers have done Masters in Public Administration there. They also set up the Lee Kuan Yew School of Public Policy which is headed by the chief propagandist for the PAP regime, Kishore Mahbubani, so I am not hopeful for an answer or acknowledgement that they have plagiarised me. If they do not respond I will reproduce my letter to them in the next few days. However here I wanted to draw readers’ attention to another highly misleading use of statistics which I spotted in a State Times’ report entitled “MTI revises down its Singapore growth forecast for next 5 years to 2-4% per annum” published on 26 May. This was itself lifted from an MTI press release. According to the figures from MTI productivity growth looks quite impressive particularly compared to Europe and even the US where productivity growth has been faster than Singapore’s for an extended period. 2.5% p.a. compounded for five years would mean productivity had grown by over 13% over this period. However MTI’s rose-tinted picture is largely the result of choosing the end of 2009 as the base year. The reality is rather more prosaic. 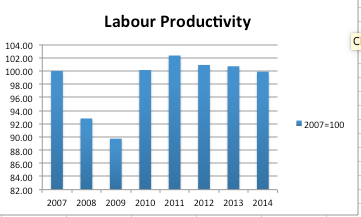 If we use 2007 as the starting year then labour productivity is lower now than it was 2007. 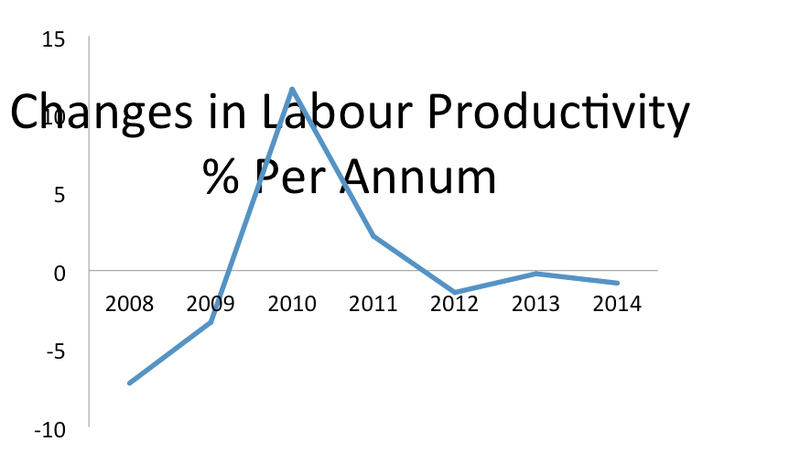 As you can see productivity dropped like a stone in 2008 and 2009, recovered sharply in 2010 and then has been flat to negative over the next four years. This illustrates dramatically that productivity is no higher today than it was in 2007. MTI is attempting to pull the wool over your eyes and convince gullible foreign journalists how well the PAP are doing. There has been no “productivity miracle” despite the wasteful corporate subsidies doled out by the Government in the form of the National Productivity Fund ( I have written an open letter to the Finance Minister asking how the money has been spent and why it is not in the Statement of Assets and Liabilities but have still to receive a reply) and the Productivity and Innovation Credit. This is why we need an independent Office of National Statistics to prevent Government ministries putting out misleading spin and disinformation. We are fortunate that in this case the data is available in the public domain. However for other statistics which I have questioned, such as rising real incomes per resident employed household member, the data are not made available to conclusively challenge the official version, despite several good reasons why the official version is misleading. As a final point Singaporeans should bear in mind that if productivity growth is close to zero then this of course means that all MTI’s forecast growth of 2-4% has to come from workforce growth over the next five years. Assuming that the contribution from the domestic workforce is zero then all the workforce growth has to come from foreign workers. In 2013 our workforce was 3.44 million. If economic growth is 2% p.a. over five years then the extra foreign workers will increase our population by some 360,000 but if it is 4% p.a. then the increase will be something like 750,000 which would take our total population to about 6.25 million by 2020. Parliament voted for the Population White Paper in 2013 which set a total population target of 6.9 million by 2030. The upper bound for growth of 4% coupled with zero or very low productivity growth would breach the target well before 2025. Day and night the telescreens bruised your ears with statistics proving that people today had more food, more clothes, better houses, better recreations — that they lived longer, worked shorter hours, were bigger, healthier, stronger, happier, more intelligent, better educated, than the people of fifty years ago. Not a word of it could ever be proved or disproved.